Delayed rectifier. The discovery of de novo mutations in ion channel genes as a cause for genetic epilepsies continues. In a recent publication in Nature Genetics, we have identified de novo mutations in KCNA2 as a novel cause of epileptic encephalopathies associated with ataxia. Interestingly, even within a single gene, two different phenotypes seem to be emerging. The KCNA2 channel is a brain-expressed potassium channel, which has six transmembrane domains. KCNA2 encephalopathy falls into two big groups, the “A phenotype” due to activating mutations in the transmembrane domain (R297Q) and “B phenotype” due to dominant-negative loss of function mutations at the transition of the six transmembrane region to the intracellular C-terminus (P405L). The KCNA2 channel. When neurons fire action potentials, they need specific ion channels to get the membrane potential back down again. Part of this task is accomplished by delayed rectifier channels, ion channels for potassium, which stabilize the membrane potential. If absent, neurons would be predicted to be hyperexcitable. The KCNA2 knock-out mouse has an epilepsy phenotype, reinforcing this idea. Likewise, the related KCNA1 ion channel results in episodic ataxia when mutated. However, as with many other genes, the prediction about a possible human phenotype is limited. 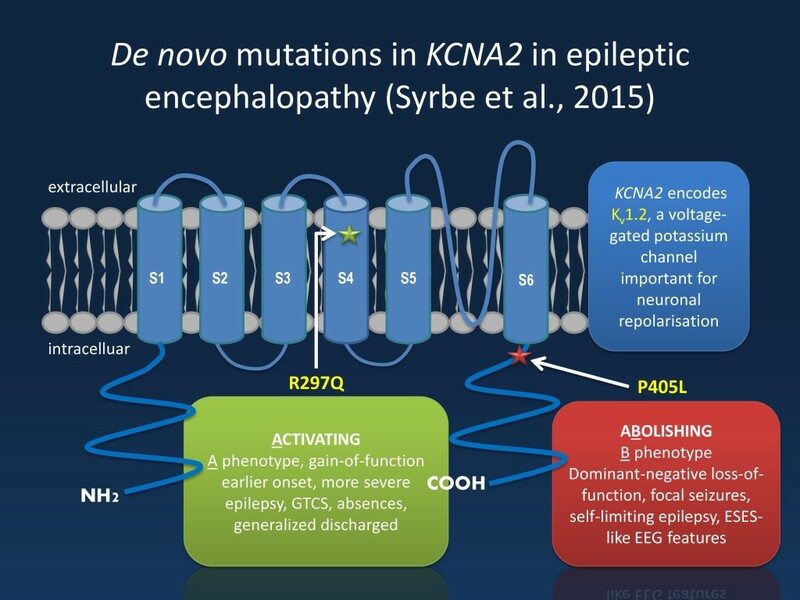 In the recent study by Syrbe and collaborators, we show that both loss-of-function and gain-of-function mutations in KCNA2 result in epileptic encephalopathies. This suggests that the right dosage of KCNA2 is crucial to control excitability of the central nervous system. Discovering KCNA2. The study by Syrbe and collaborators is not the first publication to identify KCNA2. While our publication was under review, a single case with a de novo KCNA2 mutation was reported by Pena and Coimbra. The most interesting fact about the reported patient was the mutation – it was exactly the same mutation that was identified in patient 7 in our publication. Also, the phenotype was similar, suggesting that KCNA2 encephalopathy presents with recurrent mutation-specific phenotypes. The final twist added to a growing body of evidence that mutations in KCNA2 have some interesting features – mutations and phenotypes cluster in two different subgroups, which seem to correspond with the functional consequences of the mutations. Let me explain what I mean by splitting the clinical presentation into A (“activating”) and B (“aBolished”) phenotypes. A versus B. Here is brief phenotypic overview of KCNA2 encephalopathy. The A phenotypes, identified in patients 6 and 7 in our publication and the patient reported by Pena and Coimbra, have seizure onset in infancy with myoclonic seizures and absences. Ataxia and some degree of intellectual disability is a shared feature of all patients with KCNA2 mutations. On EEG, patients have generalized discharges, and seizures were frequent and sometimes difficult to control, which is in contrast to the B phenotype. Patients with the B phenotype seem to have a slightly later age of onset around 12 months on average. In contrast to the generalized discharges in patients with the A phenotype, the electrographic features are reminiscent of ESES and activate in sleep. Seizures usually can be controlled with antiepileptic medication and finally disappear in childhood, sometimes as early as the age of 4 years. As with other patients with KCNA2 mutations, ataxia may persist. Why do I keep referring to A and B phenotypes that persistently? Because it parallels the electrophysiological properties of the mutated channel. Gain- versus loss-of-function. All three patients with the A phenotype have mutations, which result in a gain-of-function of the KCNA2 channel. At first glance, it appears counterintuitive that an increase of activity in a delayed rectifier may result in epilepsy, but the expression of KCNA2 in excitatory and inhibitory neurons is complex and it is difficult to predict the overall network effect of such an alteration. As mentioned earlier, two patients with activating mutations have the same mutation R297Q, and the third patient has an alteration in the amino acid right next to it. Both mutations affect the fourth transmembrane domain of KCNA2, which lies in the voltage sensor of the channel. In contrast, three of the four patients with the B phenotype have the same P405L mutation, which leads to a dominant-negative loss-of-function. Basically, the mutated channel affects the proper functioning of the wildtype channel. The P405L mutation locates to the last transmembrane domain of the KCNA2 channel. To summarize: A phenotype – R297Q – gain-of-function; B phenotype – P405L – loss-of-function. What you need to know. Having been part of the KCNA2 story, I witnessed a fascinating story emerging. What started out as a relatively non-specific epileptic encephalopathy became clearer with additional patients that were identified, the identification of recurrent de novo mutations, and the analysis of the corresponding phenotypes. KCNA2 encephalopathy is one of the few gene discoveries where subtle phenotypic differences between recurrent de novo mutations are obvious from the start. The differences are in fact subtle, and it will be interesting to see whether this initial hypothesis holds once further cases are identified. Both A and B phenotypes may be recognizable and distinct. Patients with loss-of-function mutations came from different cohorts and were initially classified as patient with myoclonic-astatic epilepsy (MAE) or Dravet-like epilepsies, but none of these descriptions could really capture the full clinical picture. The two phenotypes associated with KCNA2 encephalopathies may represent emerging distinct clinical entities, and I am looking forward to learning more about their clinical presentation and possible treatments. This entry was posted in 2015, autism, Bioinformatics, Epileptic encephalopathy, Publications and tagged action potential, ataxia, BRE, channelopathy, delayed rectifier, Dravet Syndrome, ESES, generalized discharges, hereditary spastic paraplegia, KCNA1, KCNA2, KCNC1, LKS, myokymia, potassium channel, SCN1A, SCN8A. Bookmark the permalink.